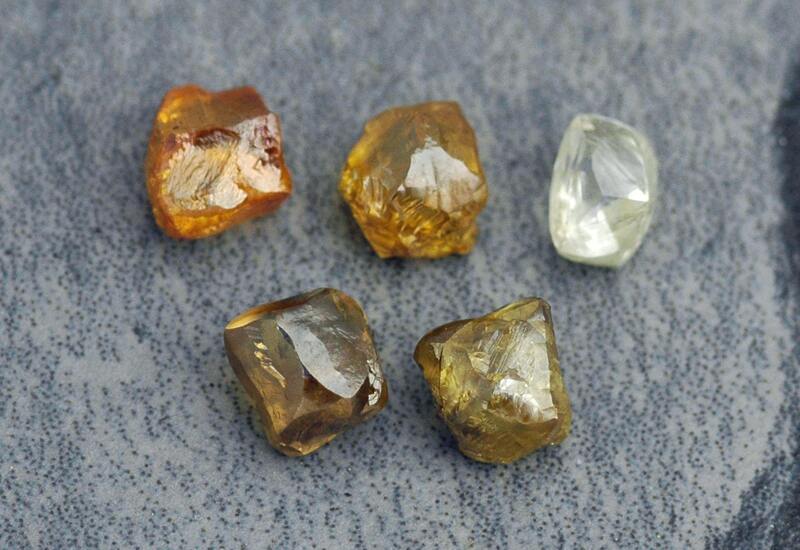 Each of my fancy coloured diamonds is certified conflict-free. I pick them for their unique colour and appearance. My coloured diamonds are naturally coloured- this is how they formed in the earth. 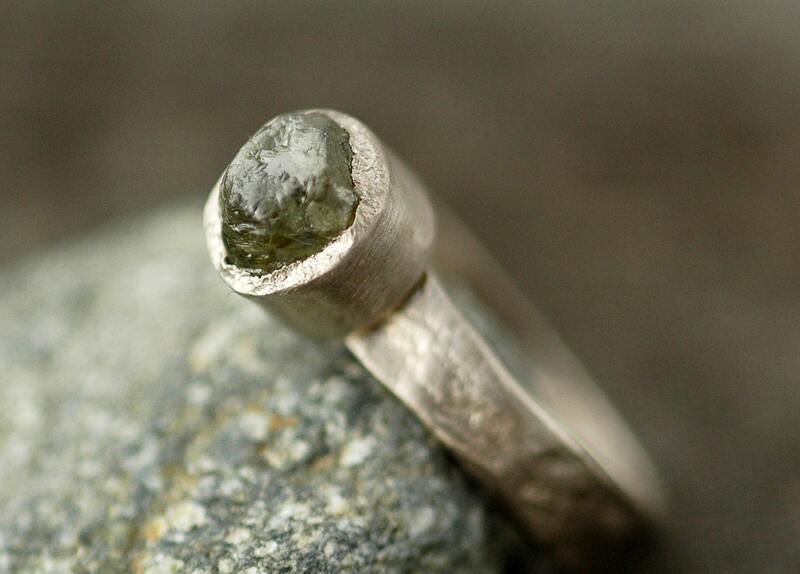 The ring shown here is a naturally-coloured olive green raw diamond. This diamond was not heat or otherwise treated- this is its natural colour. 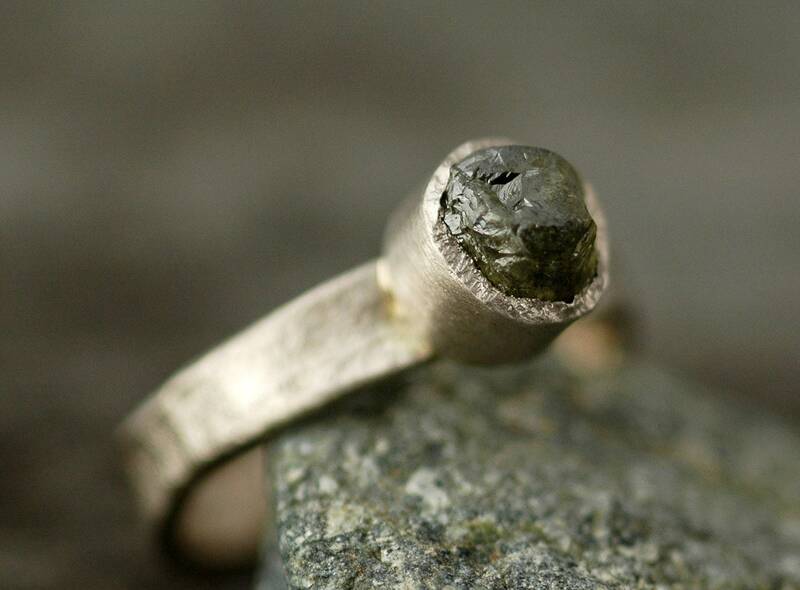 For this unique stone, I built a textural bezel setting and reticulated 4mm band in lush, 14k white gold. 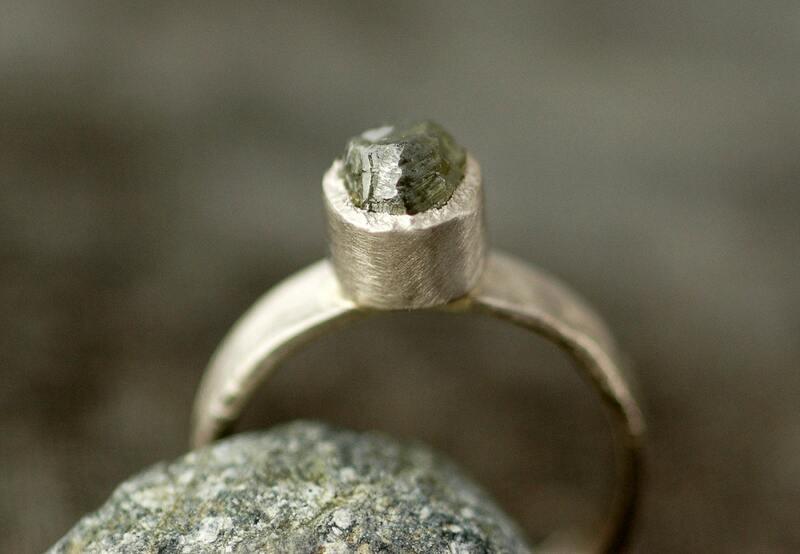 This ring is sold, and is shown for inspiration. The diamond of your choice will be prong or bezel set onto a hand forged 4mm wide ring of solid, recycled 14k or 18k gold. You may choose from rose, yellow, or white gold for your ring. The ring can also be built in 22k yellow gold. If you choose a prong setting, the prongs will be made of 14k gold in the same colour as your ring band. Band texture can be high shine, brushed/matte, or hammered. If you would like a reticulated band, as shown in the photos, please get in touch with me for additional information about this process, and the cost. My parcel of coloured diamonds were sourced from the Anaba mine in Russia. They range from pale yellow to rich orange-yellow, to cognac, to deep olive green. I have photographed the diamonds in both strong, unfiltered sunlight, and in filtered sunlight, to give you the best idea of their colours. 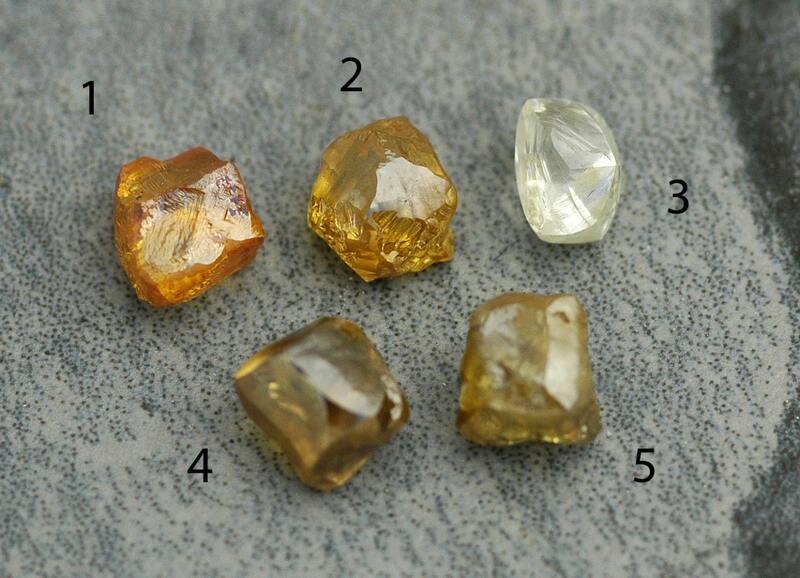 If you wish the specific dimensions or caratweight for any of these five stones, please get in touch. I can also source the coloured diamond of your choosing for you, if you do not see one here that you love. Want a wider band, or a domed/half round profile band? Want a matching wedding band? Just message me for the pricing on these options. As I design, and then hand forge, each of these rings in my studio, any design is possible. Your country’s sales taxes/tariffs are not included in this listing, and are not collected by me. The courier will invoice you for these fees at or after delivery.